Background: The Hoof Blog took a long look at the Euro “rock n roll” shoe this fall, with photos of the great Spanish PRE grand prix dressage horse Fuego, who wears them when he competes against the likes of Totilas and Parzival. His high-tech, high-fashion Italian-made (of course) aluminum shoes help him pirouette and piaffe with the best of them, as applied by his vet/farrier Hans Castelijns of Italy. Utilizing the negative space under a horse’s foot made sense to a lot of people. And curious minds have been either debating or deliberating over how it might help their horses ever since that article appeared. It went around the world and back again and was the most popular story on this blog in three years. Is Euro rock ‘n roll shoe design some kind of rocket science? Just remember: rock ‘n roll was born in the USA. Elvis and Jerry Lee Lewis would be proud of California farrier Ernest Woodward and sport-horse specialist veterinarian Mark Silverman DVM of Sporthorse Veterinary Service in San Marcos, California. 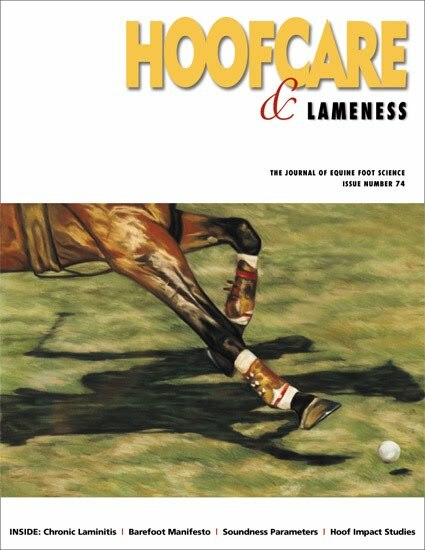 Together, they visualized an Americanized version of the concept they had seen illustrated in the Hoof Blog on a successful competition horse. Silverman challenged Ernest to figure out how to make the shoe in a cost-effective way that worked on different hoof types. 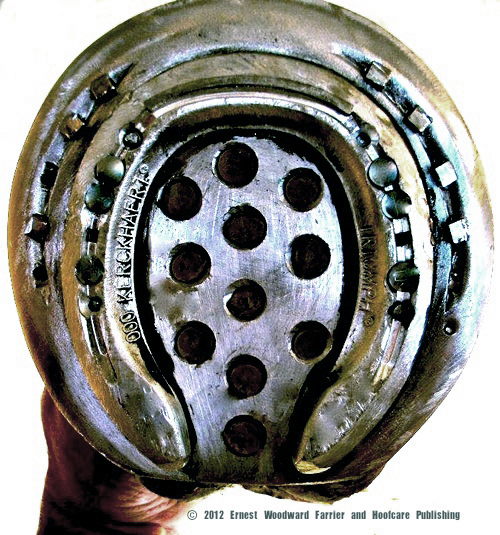 California dressage-specialist farrier Ernest Woodward Americanized the Euro-style 3-D full rolling motion shoe with a simple fabrication plan. 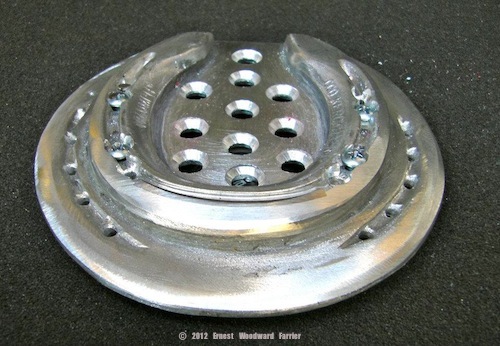 A base plate and pony shoe are held together with a few screws and some PMMA adhesive. Ernest began by cutting the 6mm plate out with a jig saw. Black Equilox (PMMA adhesive) holds the shoe to the plate. He also drilled holes in the crease of the pony shoe and placed a few screws through the plate to secure the two levels of aluminum. The impression material used under the plate is brown Sound Horse 25 durometer (extra-soft), pre-medicated with copper sulfate. 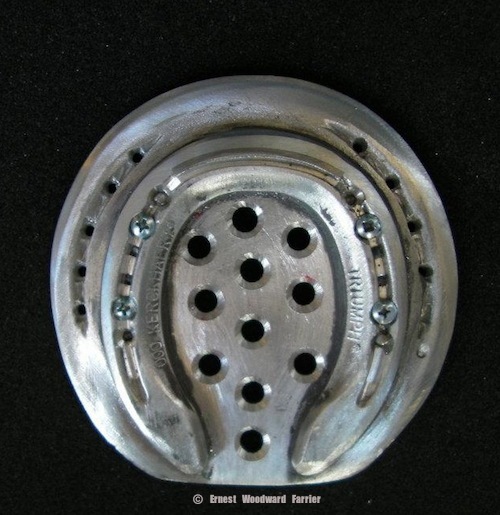 Ernest’s two-fiered design (shown with foot surface down, ground surface up): On hard surfaces, the horse stands on the inner, or bottom, shoe--a Triple 0 Kerckhaert Triumph aluminum pony shoe. 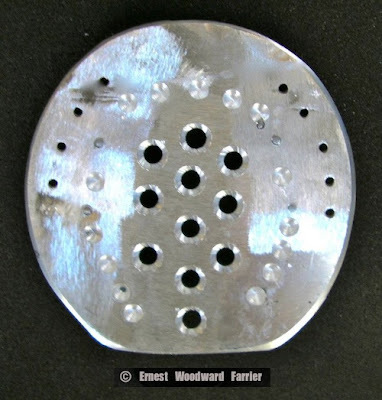 The outer foot plate conforms to the foot’s shape from heel to heel. The inner shoe, a.k.a. the breakover sweet spot, kicks in for the “lateral” work required in upper level dressage. My conversations with Ernest and Dr Silverman reminded me of talking to designers of racing sailboats. Much of the stability of a saiboat is based on what’s underwater--the shape of the hull and the keel. When it comes to the racing boats at the level of The America’s Cup, there’s a lot of sail up in the sky but it has to work seamlessly with what’s under the water. A hoof isn’t shaped anything like a hull but would a dressage horse benefit from a little bit of a keel in arena footing to help it turn with less stress on joints and ligaments?? These shoes were called “flying saucers” when they first came out. Can you see why? Both Ernest and Dr Silverman shared my interest in what happens when a horse hits the corner of the arena or is asked to do non-linear movements. When a sailboat falters, the sails are said to “luff”. They flutter against the mast until the vessel corrects course and the wind fills them again. A lot of horses luff a bit in deep corners. “I’ve known a lot of horses that would earn nothing but 10s if they only had to go in a straight line,” Dr Silverman remarked. We go to great lengths to study how horses land when going straight and extrapolate that the horse uses that landing pattern throughout his work. But think about it: Does shoe wear always reflect the linear landing pattern? “A square toe helps when the horse is going in a straight line, but can actually lengthen the breakover distance when the horse needs to break over the corner of that squared toe,” Ernest observed, then added that a minimum bevel on his shoes is from second nail hole to second nail hole. It all began with a simple aluminium plate cut out with a jigsaw to match a tracing of the horse’s foot. The border is beveled and nail holes drilled. The sample shoe that Ernest made for this article has a crease in the plate so it looks startlingly like two shoes. He said he heated up the plate to make the crease and punch the nail holes but that is the only heat he used in the fabrication. Ernest Woodward is an analytical farrier with a penchant for video documentation, which Dr Silverman also shares. Ernest analyzed a current grand prix dressage test and found that 34 percent of the movements required lateral work by the hind end of the horse. With that fact in hand, Ernest now builds a smaller-scale lateral rocking effect into almost all his hind dressage shoes. 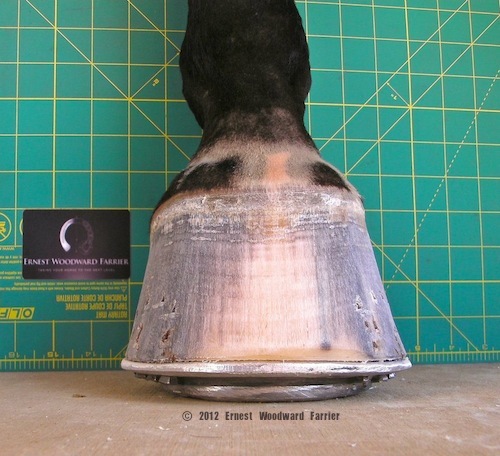 Lateral view of the shoe nailed on; the horse is standing on a hard surface to lllustrate the height of the shoe. Ernest said that the materials used cost a total of perhaps $25 for a pair of shoes that would be affordable to most owners, including the adhesive. Ernest remarked that slipping hasn’t been a problem for the horses wearing these shoes; they live in deeply-bedded stalls and work in cushioned arenas. He said that the only hard surfaces his clients’ horses walk on are some concrete walkways and barn area paving blocks. “The shoe is a surprisingly more stable platform than I anticipated on a hard surface,” Ernest remarked. If horses were subject to a lot of walking on hard surfaces, an interesting feature of this shoe might be that the plate can be reset and a worn wear-point pony shoe can simply be unscrewed and replaced. 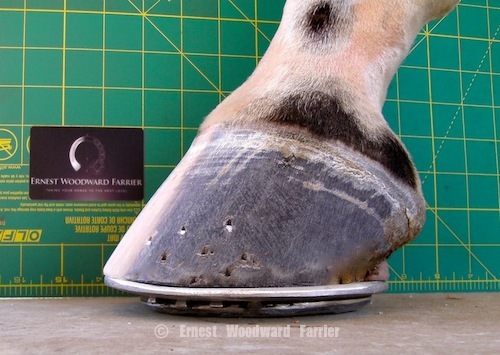 The finished shoe lifts the horse about 14 mm on a hard surface (6 mm plate plus about 8 mm thick pony shoe). “The horse was trotted afterward and looked very promising in the arena in a fairly tight circle on the lunge. We are eager to see how this horse progresses over time,” Ernest commented. The case: Hanoverian mare, 16’1” tall, age 10, working at third or fourth level, with a history of medial collateral ligament strain. The history: She had previously been shod with Kerckhaert Steel Comfort shoes and leather wedge pads with brown dental impression material. “That was successful for a time,” Ernest recalled. “I’d say that it was improvement, but not a fix.” The California-style 3D Euro full rolling motion shoes were nailed on in January and Ernest saw immediate improvement. This video was shot about a week after the new shoes were applied. Notice: All images, media and text in this article are protected under international copyright by Fran Jurga and Hoofcare Publishing. No use without permission. Images and video © Ernest Woodward and Erin Ryder. 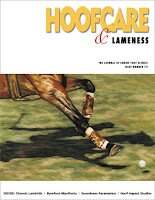 This article and media are provided for the enrichment of subscribers to Hoofcare and Lameness Journal. This is their blog. 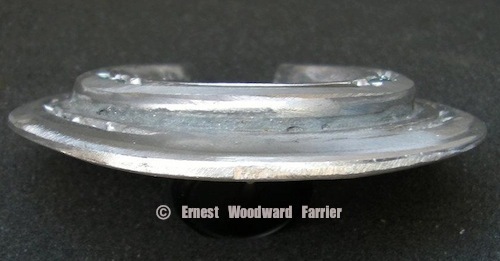 For more about Ernest Woodward: you can "like" his Ernest Woodward Farrier Facebook page. For more about Mark Silverman DVM, visit the SportHorse Veterinary Services web site. Click this text to go to order page and we'll send your copy right out! From mackin_theresa@yahoo.com I have seen a similar version of this shoe used for ringbone in Arizona. There was no plate on the bottom and the smaller shoe was welded to the larger one. However the farrier said it was invented by an Italian blacksmith. Theresa, thank you for your comment. The farrier you spoke with may have been referring to Dr Hans Castelijns, the vet/farrier from Italy who helped Fuego, as mentioned in this story. He has been promoting the "flying saucer" or "Euro rock n roll" shoe for some time. It comes in different forms. I am not sure who invented it, it seems to have been around in many forms for a long time, but Dr Castelijns has helped to popularize it in "modern" times. The shoes are sold commercially by an Italian manufacturer and probably other companies in Europe.